"Victor Goodview" is NOW on TROMA NOW! Sure, Victor is meant to be fully experienced on the big screen. But when there is no big screen, we trust the small screen will still provide you with a visceral experience. So if you can’t wait to catch it at a festival near you, there’s no better way than to see it at Troma Now. They even offer a free 30-day trial. 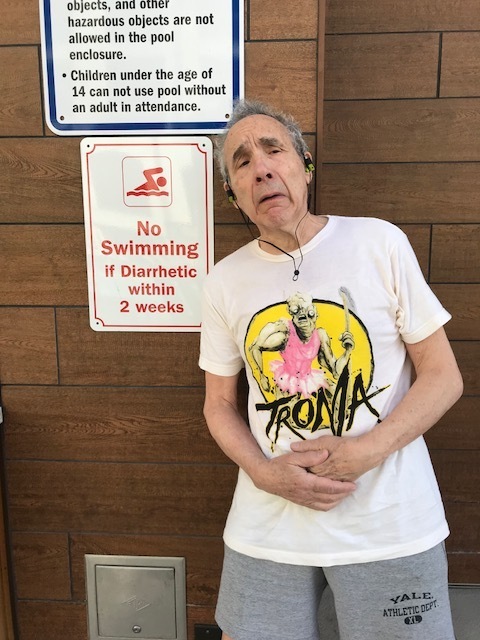 Troma Entertainment acquires Victor Goodview! Exciting news, folks! Troma Entertainment has acquired our deliciously filthy opus Victor Goodview – a match made in the poopier heights of heaven! What came first, Lloyd's constipation or Victor Goodview? We at Larkin-Stanhope would hazard to suggest a timetravely paradox (think T2) best illustrates our relationship. Or is it perhaps not a paradox at all? If anybody who's perusing this page would like to weigh in, do not scruple to contact us. Is it, however, more akin to the cosmic phenomenon that allowed room in this world for both Larry David AND Jerry Seinfeld, and THEN brought those two dust mite scale iconoclasts together? Yes at this very moment in this free associative account of the history of our film, we believe that the latter is a safe comparison to set side by side with Lloyd Kaufman's late-onset bowel blockage and the philantropic inception, creation & belching forth of Victor Goodview.